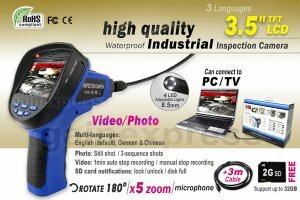 This 3.5" TFT LCD Industrial Endoscope (Visual Inspection Device) allows to investigate hard to reach area. It helps in diagnosing broken part, weld point and other work that would otherwise not easily accessible for direct inspection. The LCD screen can be rotated by 180° to adjust the angle of observation with increased visibility up to 5x magnification capacity making the process more visible, convenient and easy. The standard 1m Flexible & removable tube have a waterproof level IP67 camera head with optimized Focal Length of 6cm, you can inspect area under water, gaps and holes effortlessly. Plus, it comes with 3M (9.9ft) extension cable so you have 4M cable in total length that allows you to extend the vision of inspection point.